150mpg Mitsubishi SUV and Juke rival | What Car? Mitsubishi is looking to grow sales and update its image with a string of efficient small cars, electric vehicles and hybrids. While the L200 pick-up and Shogun 4x4 will remain big sellers for the brand, UK managing director Lance Bradley said he wants small and efficient cars to help grow sales from 19,000 to 30,000 over the next five years. The Concept Global Small will go on sale in 2013, with prices starting at less than 8500, emissions from around 95g/km and a fully electric version available. There will also be more products based on the platform, promised Bradley, with a sub-ASX rival for the likes of the Nissan Juke being the most obvious option. Bradley says a plug-in Outlander SUV is also currently undergoing tests, and that it has achieved as much as 150mpg. The company says it will have eight electric vehicles and plug-ins on offer by 2015, and is also working on hybrid technology. The ultimate target is for 20% of Mitsubishis sold by 2020 to be electric- or plug-in hybrid electric vehicles. Bradley said being first to the electric car market with the i-MiEV came at a cost because each car is sold at a loss. However, he believes the EVs value is in helping to change the perception of the brand and reach new buyers. 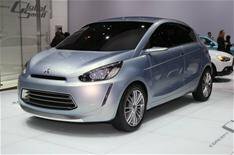 While the i-MiEV might not be suitable for every customer that visits one of the 13 Mitsubishi showrooms selling the car, it's helping to put dealerships in touch with buyers for the other hybrid, electric and plug-in vehicles on the way from Mitsubishi.